Students and community members in San Diego County plan to march for gun control today as part of the nationwide "March for Our Lives." 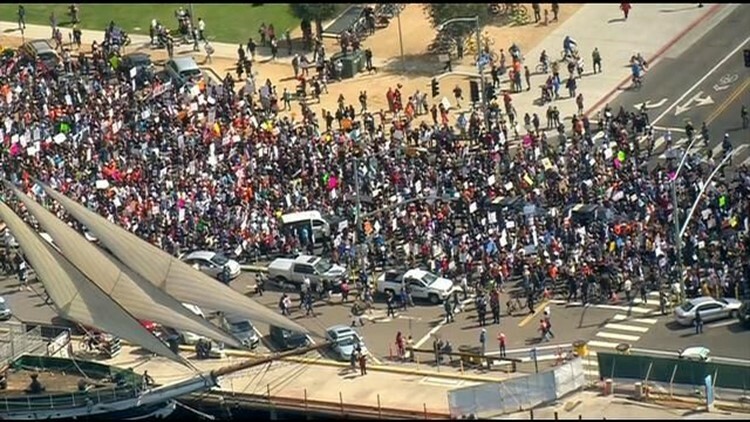 SAN DIEGO (CNS) - Thousands of people marched through downtown San Diego and other locations in the region as part of the nationwide "March for Our Lives." 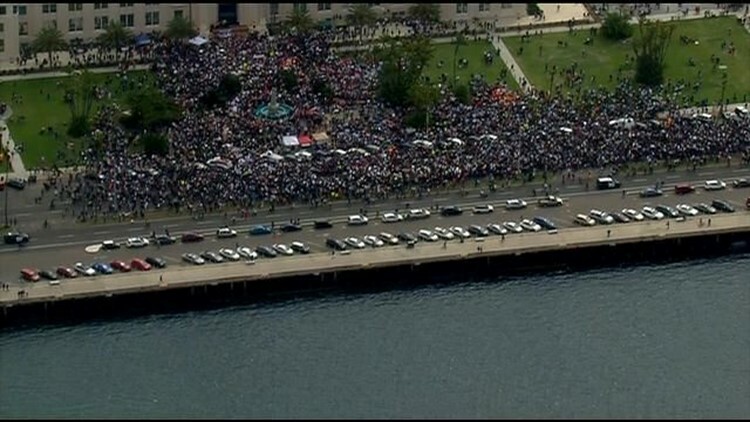 Protesters began assembling in Waterfront Park around 10 a.m. Saturday. 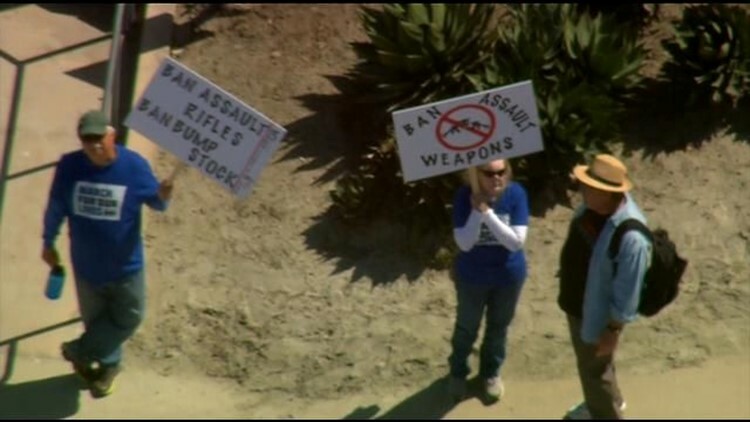 Rallies also took place at Swami's State Beach in Encinitas and Escondido City Hall. San Diego police Sgt. 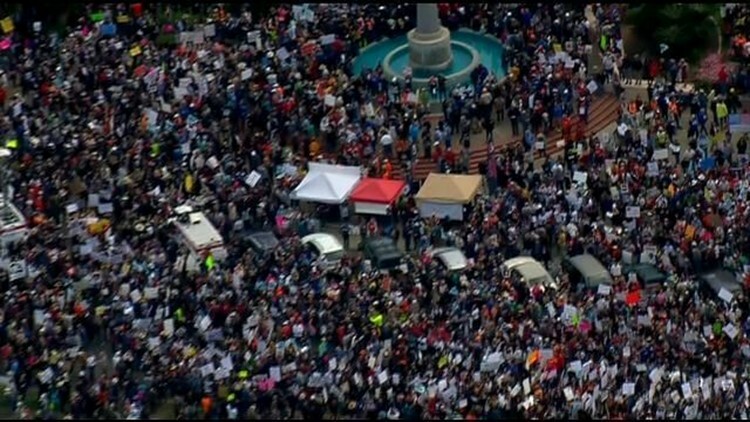 Robert Hawkins said officers estimate about 5,000 -- 10,000 people took part in the march -- close to what organizers were expecting prior to the event. 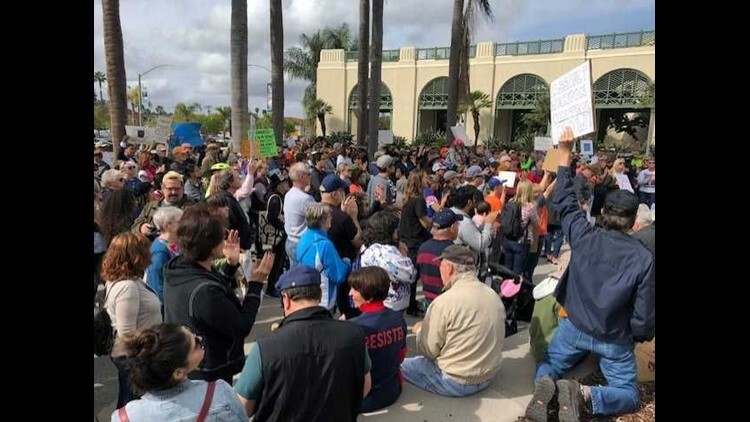 The Encinitas march drew about 1,200 people, and about 800 - 1,000 attended the Escondido march, according to law enforcement in those jurisdictions. Organizers of the nationwide march are calling on politicians to find a solution to gun violence in the wake of the Feb. 14 mass shooting at Marjory Stoneman Douglas High School in Parkland, Fla., where 17 people died. Rallygoers read the names of each of the Parkland victims to the throngs of people at the downtown march. Mohamed Elnakib, one of the organizers of the downtown march, said he was impressed by the turnout. "It was an unforgettable experience," he said. Elnakib said he wants people to understand that he and others at the march will continue to advocate for more gun regulations after Saturday. "We basically want people to realize this movement is not dead after the march," he said. "We're going to continue to advocate against gun violence." Sohini Desai, a UC Berkeley senior who said she was home in San Diego for spring break, was one of the students marching in the rally. Desai said seeing the survivors of the Parkland shooting begin advocating against gun violence made her feel like she needed to do something, too. "I think time and time again, we've seen these shootings happen all across the country with varying body counts," she said. "(The Parkland shooting) was a really powerful moment, and like others, it really inspired me, sprung me into action and I was just happy to see that finally, after all of these years, after all of these shootings, there's a culmination and a rising- up that's happening, and I just wanted to be a part of it." She said the number of people at the march exceeded her expectations.
" I thought that all of us on this side were the totality of who was marching, but then I looked across the street and saw there was another entire group just like us, so it's, I think, thousands more than what I expected," she said. Nona Golan, a senior at Scripps Ranch High School, also said the shooting in Florida caused her and her friends to become involved with gun control activism. "We want to help the reform, want to sign some petitions," Golan said. "We all got pre-registered to vote. We want to contribute to the voice. We want to try and make a change." Nona Golan, a senior at Scripps Ranch High School, also said the shooting in Florida caused her and her friends to become involved with anti-gun activism. "We want to help the reform, want to sign some petitions," Golan said. "We all got pre-registered to vote. We want to contribute to the voice. We want to try and make a change,"
The march comes a little more than a week after thousands of students took part in a national school walkout to advocate for gun restrictions on the one-month anniversary of the Parkland shooting. Golan said other students at her school were overwhelmingly in support of the walkout. "On the last walkout we had at 10:00 (on March 14), I think everybody -- almost everybody from our school walked out in the center and we had speakers and everybody was very enthusiastic in lending their voice," she said. "It was actually really inspiring." Several members of the San Diego Education Association -- the union representing teachers in the San Diego Unified School District -- also marched on Saturday. "We're out here today to stand with our students," said Lindsay Burningham, president of the San Diego Education Association. "Today is a student-led day, in support of ending gun violence and school safety, and we're out here in support of students and I believe that we shouldn't be arming teachers with guns but arming our schools with nurses, counselors, social services." "We are basically calling on our political leaders to advocate and pass legislation that will help keep our students and our community safe," he said. All kinds of students, from elementary school to college, helped out, Elnakib said. 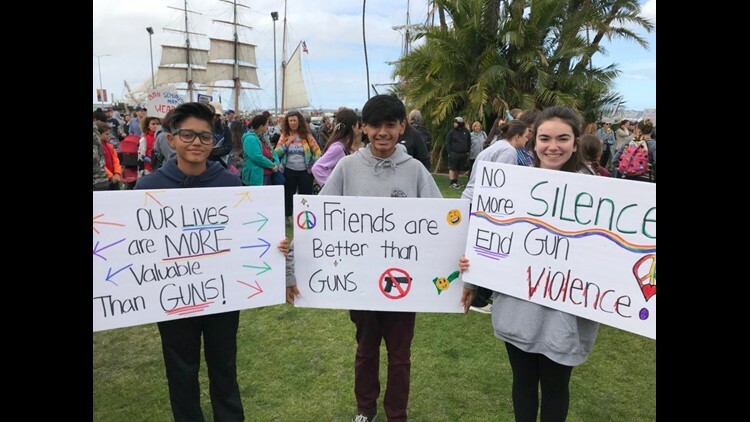 "We really wanted to make sure that we highlighted and uplifted the student voices, because many of the events in San Diego are often organized by community organizations," he said. "Our students are the future, and our students will be voting very soon," Elnakib said. "If the politicians are not listening to our students, then they will be voting them out." The Trump Administration issued a statement about the nationwide demonstrations through Deputy Press Secretary Lindsay Walters. "We applaud the many courageous young Americans exercising their First Amendment rights today," Walters said. "Keeping our children safe is a top priority of the president's, which is why he urged Congress to pass the Fix NICS and STOP School Violence Acts, and signed them into law. "Additionally, on Friday, the Department of Justice issued the rule to ban bump stocks, following through on the president's commitment to ban devices that turn legal weapons into illegal machine guns."